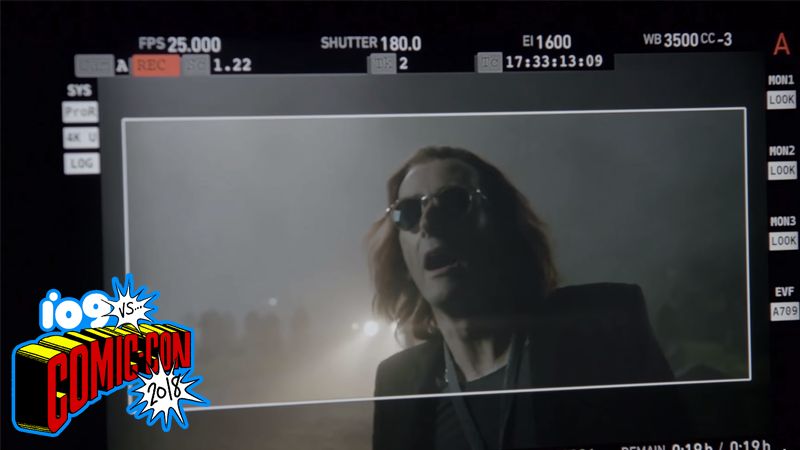 David Tennant in action as Crowley in the live-action adaptation of Good Omens. We’ve seen little bits here and there of Amazon and the BBC’s adaptation of the beloved Good Omens, by Neil Gaiman and the dearly missed Terry Pratchett. But while Comic-Con didn’t give us a trailer, it did let us peek behind the curtain to see the novel’s fantastical mishmash of Angels and Demons come to life, plus a new bit of casting. Shown at San Diego Comic-Con today, this behind-the-scenes reel for Good Omens gives us a few brief snippets of what to expect from David Tennant and Michael Sheen’s take on Crowley and Aziraphale, as they briefly discuss the challenges of filming an absurdly funny and weird novel like Good Omens. Plus, Gaiman on set! With a dog! The reel also touches on the absence of Pratchett, who sadly passed away in 2015, acknowledging the spirit of his writing is maintained in the upcoming adaptation. Speaking to the gathered audience at Amazon’s Comic-Con panel, Gaiman noted that the biggest challenge in making the show “was the absence of Terry Pratchett from this world,” and that Good Omens honors his memory by being “very funny and very serious at the same time.” As it rightly should! Bring on the apocalypse! Good Omens is set to hit Prime Video and BBC One in 2019.